SETUP should be done as follows. First you will set up the Control Record. This determines your fiscal year, current and prior-year P&L accounts, department designations, and earliest posting date. You must create the control record first. Next you will set up your Chart of Accounts. Your Execu/Tech Back Office system comes with a sample Chart of Accounts, You can edit and use this one, or we can clear it completely and you can start with a new chart of accounts. We can import your chart of accounts from a CSV spreadsheet. There may be a charge for this, depending on your data format and whether any conversion is required. You will format your Balance Sheet and Profit & Loss (Income) Statement as you set up your chart of accounts. Next you can create templates for Recurring Journal Entries. This saves time in transactions you post on a regular basis, such as bank fees or transfers. This is not for transactions created automatically by the system such as accounts payable postings, condo owner expenses, or accounts receivables charges such as membership billing. Each of those modules will create the GL entries for you. If you have multiple profit centers and more than one General Ledger company, you can set up Inter-company transfer accounts. This is used with Accounts Payable and not for transfers from one company to another. This allows you to use one company's funds to pay A/P invoices from another company. This will be followed by journal entries which you can post manually or via the Recurring Journal Entries function. Once you have completed the General Ledger, you are ready to interface GL to other Execu/Tech programs such as Execu/Suite PMS, Execu/Touch POS, Condo, and Inventory Control. Make sure your Execu/Tech Terminal ID is unique based on the information here: Terminal ID Number Codes-Batch Terminals . Go to Back Office - General Ledger - General Ledger Processing. Your menu may be a little different. 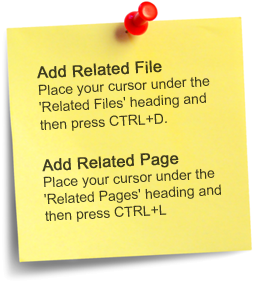 From the GENERAL LEDGE RPROCESSING menu select #5, set-up control record. 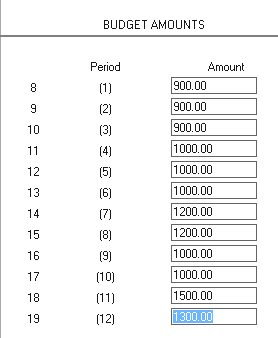 Fields 1 through 12 set the beginning of each period and set your fiscal year. If your fiscal year starts October 1, for example, you would enter 1001 in field 1 and continue for the next twelve periods. These fields are required. Field 13 is for the account number your prior year profit or loss. This account is used internally for the system to calculate prior years profit and loss using the figures from your income and expense accounts. You should NOT post anything to this account. This might not be your "retained earnings" account. This field is required. Field 14 is for the account number for your current year profit and loss. This account is used internally for the system to calculate the current year's year profit and loss using the figures from your income and expense accounts. You should NOT post anything to this account. This field is required. Field 15 is optional and is where you can designate the earliest posting date allowed. For example, after you have closed out a year, you can put the day following that year's ending date as the earliest date you will allow new transactions to post. Field 16 is used to determine where, in the account number, you are designating departments. This is optional. Each account number can be up to ten characters and may contain letters, numbers, or characters. The department designation can be at the beginning, end, or in the middle. In the example below, the two characters after the "." designate the department. The 6th character is the beginning position and the 7th character is the ending position. Note that the "." is considered a character. Field 17 should be left blank. When your cursor is back at the bottom of the screen, type a number to go to that field or type Y to save the information. If you will use General Ledger in more than one company, you will need to set up your chart of accounts in both/all companies. If the account numbers will be the same, you can select "Copy Chart of Accounts from Model" located on the General Ledger menu. You can use the sample chart of accounts that came with your system and edit it to suit, or you can create a new chart of accounts from scratch. We can import your chart of accounts from a CSV spreadsheet. There may be a charge for the import, depending on the file format and whether conversion is required. 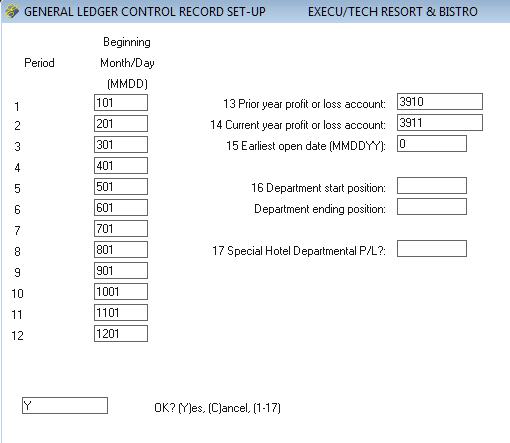 To set up your General Ledger Chart of Accounts, Go to Back Office - General Ledger - General Ledger Processing. 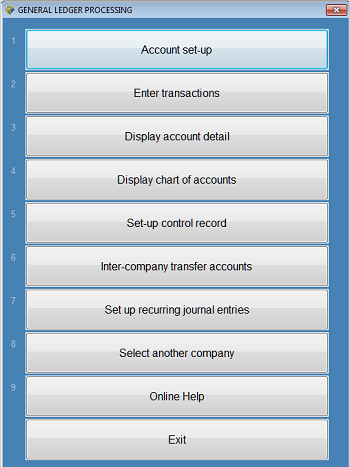 From the General Leger Processing menu, select Account setup. You will set up asset accounts, liability accounts, income accounts, and expense accounts. 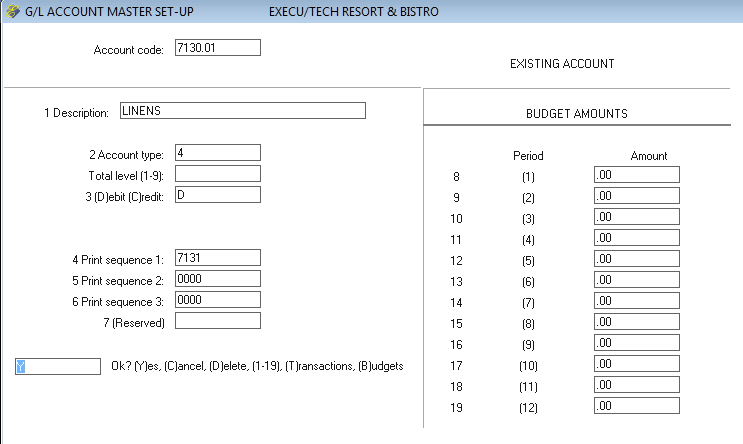 You also will set up accounts for report formatting, including comments and totals. Each account type is described below. The account number can be up to ten characters and may be letters, numbers, and characters. The coding is case sensitive, so capital letters are not the same as lower case letters. The account number is the record "Key" and cannot be changed. The description can be changed. 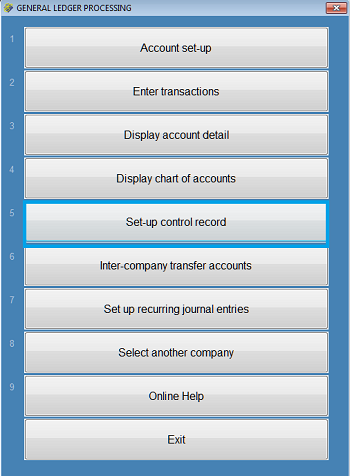 To use departments, see Control Record Setup for explanation. Above is an example of an asset account. The description may be whatever you wish, up to 30 characters. The account type will be 1. Typically an asset account is a debit account but your accountant can advise you if it should be otherwise. You can have up to three report formats, designated by Print sequences 1, 2, and 3 (Fields 4, 5, and 6). 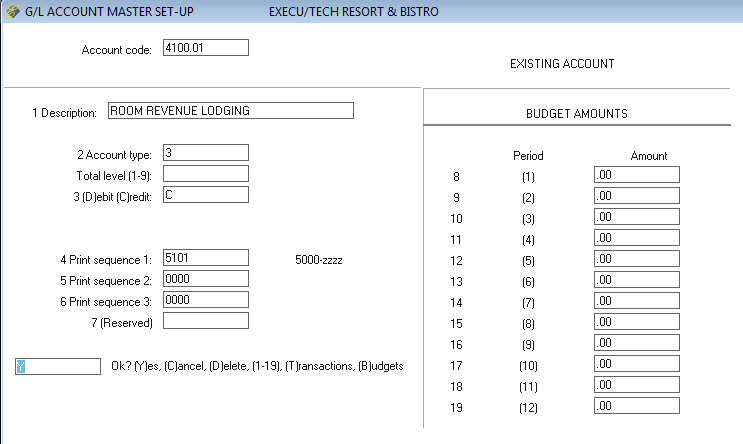 You need at least one print sequence so that you can print your balance sheet. Print sequence numbers for balance sheet items (account types 1 and 2) may be 0001 through 4999. The sequence determines where it prints on the report. For example, sequence 1004 will print before 1010. If two or more accounts share the same print sequence, the sum of the two will print on the report. An account with no print sequences assigned will not print. When possible, save a few numbers between each print sequence so that you can insert accounts later. For example, if you assign 1010 to the first account and then 1015 to the next account, you have 1011 through 1014 to insert later. When your cursor is at the "Ok?" prompt, type Y to save the information. Type the field number to return to a field if you wish to make a change. Above is an example of a liability account. An equity account will be set up the same. The description may be whatever you wish, up to 30 characters. The account type will be 2. Typically liability and equity accounts are credit accounts but your accountant can advise you if it should be otherwise. You can have up to three report formats, designated by Print sequences 1, 2, and 3 (Fields 4, 5, and 6). 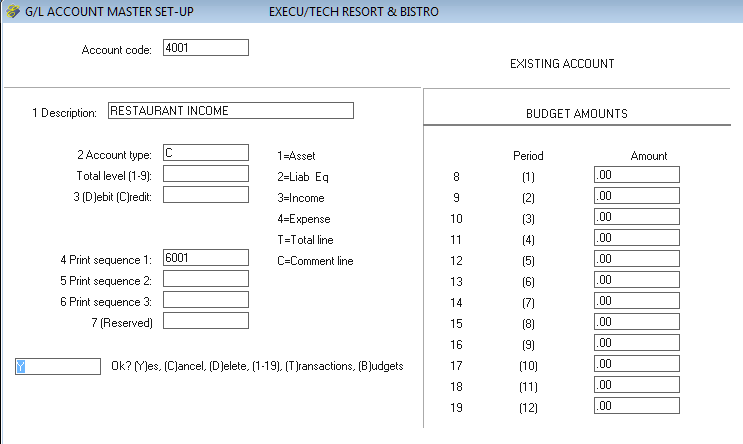 You need at least one print sequence so that you can print your balance sheet. Print sequence numbers for balance sheet items (account types 1 and 2) may be 0001 through 4999. The sequence determines where it prints on the report. For example, sequence 2004 will print before 3000. If two or more accounts share the same print sequence, the sum of the two will print on the report. An account with no print sequences assigned will not print. When possible, save a few numbers between each print sequence so that you can insert accounts later. For example, if you assign 2010 to the first account and then 2015 to the next account, you have 2011 through 2014 to insert later. Above is an example of an income account. The description may be whatever you wish, up to 30 characters. The account type will be 3. Typically an income account is a credit account but your accountant can advise you if it should be otherwise. You can have up to three report formats, designated by Print sequences 1, 2, and 3 (Fields 4, 5, and 6). You need at least one print sequence so that you can print your Profit & Loss (Income) Statement. Sequence numbers for P&L items (account types 3 and 4) may be 5000 through 9999. The sequence determines where it prints on the report. For example, sequence 5001 will print before 5004. If two or more accounts share the same print sequence, the sum of the two will print on the report. An account with no print sequences assigned will not print. When possible, save a few numbers between each print sequence so that you can insert accounts later. For example, if you assign 5010 to the first account and then 5015 to the next account, you have 5011 through 5014 to insert later. Above is an example of an expense account. The description may be whatever you wish, up to 30 characters. The account type will be 4. Typically an asset account is a debit account but your accountant can advise you if it should be otherwise. You can have up to three report formats, designated by Print sequences 1, 2, and 3 (Fields 4, 5, and 6). 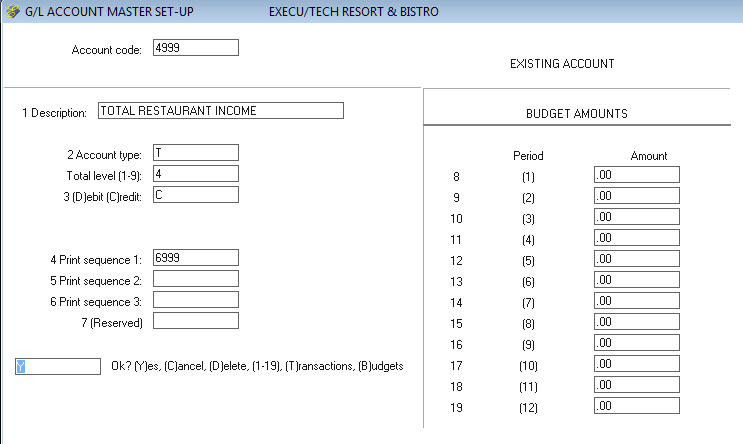 You need at least one print sequence so that you can print your Profit & Loss (Income) Statement. Sequence numbers for P&L accounts (account types 3 and 4) may be 5000 through 9999. The sequence determines where it prints on the report. For example, sequence 7004 will print before 7010. If two or more accounts share the same print sequence, the sum of the two will print on the report. An account with no print sequences assigned will not print. When possible, save a few numbers between each print sequence so that you can insert accounts later. For example, if you assign 7010 to the first account and then 7015 to the next account, you have 7011 through 7014 to insert later. Above is an example of comment or heading account. No transactions post to this account, but it must exist in order to print on the Balance Sheet or Profit & Loss (Income) Statement. The description may be whatever you wish, up to 30 characters. To create an extra line on the report, create a comment account, but leave the description blank. Typing P in description will create a page break. The account type will be C.
You may leave the Debit/Credit field blank for comment / heading lines. You can have up to three report formats, designated by Print sequences 1, 2, and 3 (Fields 4, 5, and 6). 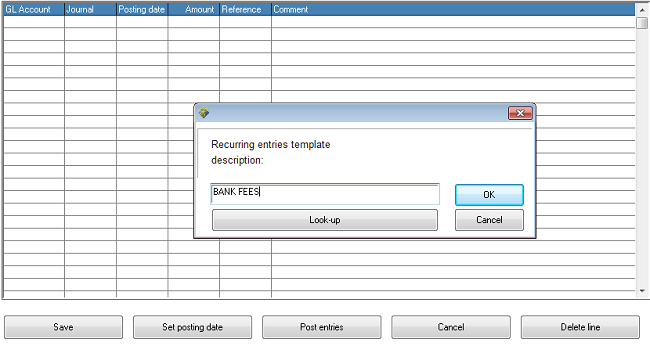 You need at least one print sequence so that you can print your balance sheet. Balance sheet items (account types 1 and 2) may be 0001 through 4999. P&L (Income) Statement items (account types 3 and 4) may be 5000 through 9999. The sequence determines where it prints on the report. For example, sequence 2004 will print before 2010. An account with no print sequences assigned will not print. When possible, save a few numbers between each print sequence so that you can insert accounts later. Above is an example of a "Total" account. No transactions post to this account, but it must exist in order to print on the Balance Sheet or Profit & Loss (Income) Statement. The description may be whatever you wish, up to 30 characters. The account type will be T. After you type "T" your cursor will move to the "Total level" field. Type 1 to 9 for the total level for this record. Grand totals would be the higher numbers, sub totals would be the lower numbers. For example, you might use Total Level 5 for the sum of Level 4 subtotals. Your Grand Total might be Level 9. You should type D or C in the Debit / Credit field as appropriate to the type of total you are creating. You can have up to three report formats, designated by Print sequences 1, 2, and 3 (Fields 4, 5, and 6). You need at least one print sequence so that you can print your balance sheet. 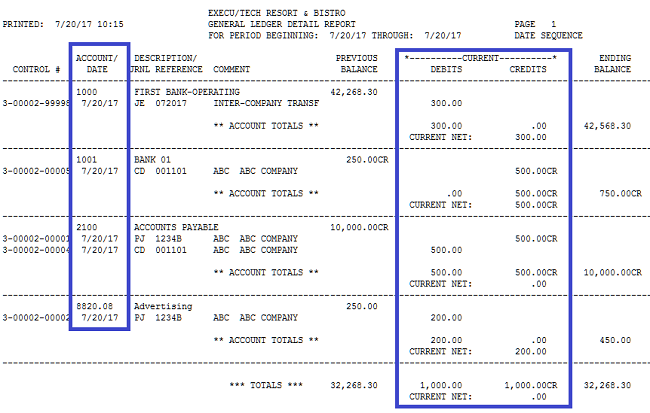 Balance sheet items (account types 1 and 2) may be 0001 through 4999. P&L (Income) Statement items (account types 3 and 4) may be 5000 through 9999. The sequence determines where it prints on the report. For example, sequence 2004 will print before 2010. If two or more accounts share the same print sequence, the sum of the two will print on the report. An account with no print sequences assigned will not print. When possible, save a few numbers between each print sequence so that you can insert accounts later. For example, if you assign 1010 to the first account and then 1015 to the next account, you have 1011 through 1014 to insert later. Budgets apply to Profit & Loss (Income) Statements and may be set for Type 3 and Type 4 accounts. When you type B into the "Ok?" 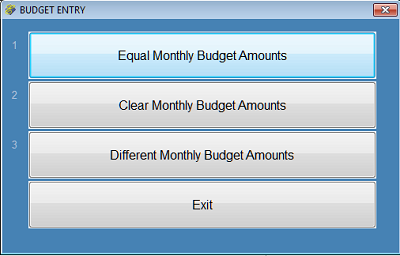 prompt and press Enter, a menu will display allowing you to create equal monthly budget amounts or a budget per month. 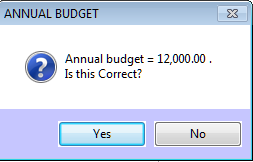 If you select "Equal Monthly Budget Amounts" a popup will prompt for the annual amount. The amount you enter will be divided by 12 for each monthly budget. If you select "Different Monthly Budget Amounts" your cursor will go to each field so that you can enter the budget for that month. When you have completed setup of your chart of accounts, you should print the following reports to make sure there are no errors and that you like the way it looks. 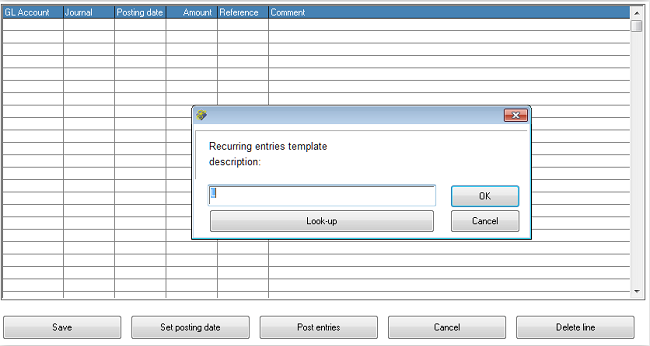 You can create templates for recurring journal entries so that you do not have to post recurring transactions manually. 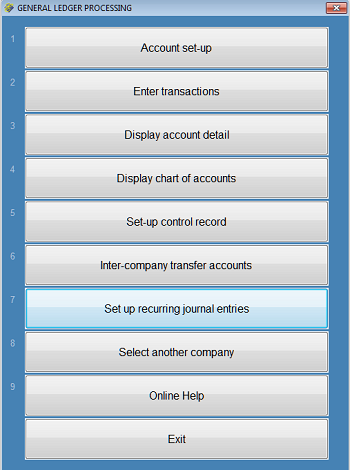 Go to Back Office - General Ledger - General Ledger Processing - "Set up recurring journal entries". At the prompt, enter the name of the template. The example below is for bank fees. Enter the GL Account code, the Journal code to post, the posting date, the amount, and an optional Reference and Comment. 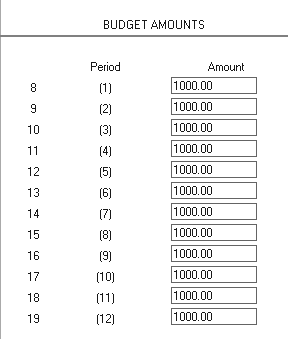 When entering the amount, type a minus sign if it should post as a credit; omit the minus sign if it should post as a debit. You may enter as many transactions as you wish in any template. Remember to create both the debit and credit transactions. Here is what the transactions look like in the batch, after posting. To an the existing template, Type L and press Enter or click Look-up. Select the template from the list. The template will display, allowing you to make changes. To set the same posting date for all lines, click "Set posting date". The new date will show up. Change the amounts, references, and comments if appropriate. Remember to type a minus sign to create credit postings. When you are finished, select "Post entries". Reminder: After you have posted the journal entries, update the GL batch. 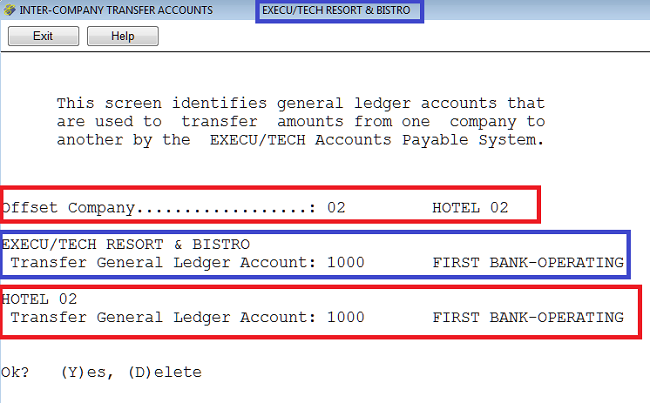 Go to Print and Update Transaction Batch from the General Ledger menu. You will use this feature only if you have more than one General Ledger company and you wish to split one A/P payment between banks in two or more GL companies. For example, if you owe ABC Company $500 and wish to pay $200 from Company 01 and $300 from Company 02, then you would use this feature. Note that most properties do not do this. The A/P system will transfer monies from each designated company into the company where you process A/P. When you create the A/P invoice, the expense/liability will post into the company designated when you create the invoice. The credit (accounts payable) postings will be in the company in which you are processing A/P. When you pay the invoice, the GL A/P debit will post into the A/P company in which you are processing A/P. The G/L bank credit will post to the GL account designated in the A/P Control Record and selected during "Print Checks". Additional transactions will post according to how you have set up the Inter-company transfer accounts configuration. A GL debit will post to the GL account for the TO company and a GL credit will post to the GL account for the FROM company. GL accounts must exist in both companies. They do not have to be the same account numbers. If they should be the same you can run "Copy Chart of Accounts from Model", located on your General Ledger menu. In the following example, a $500 A/P invoice will be created in Company 01 and paid from Company 01. Expenses will be split between Company 01 and Company 02. Money will be transferred from Company 02 into Company 01 to pay for Company 02's portion of the invoice. Although processing is not covered in this "setup" section, we are including it so that setup will make more sense to you. Go into the Company from which you will create and pay A/P invoices. This is the company that the money will be transferred TO. If you will be processing A/P from more than one company and need inter-company transfers for funds, do this from each Company. From your General Ledger Processing menu, select "Inter-company transfer accounts". In the following images, Company 01 is indicated in blue and Company 02 is indicated in red. The above was done in Company 01, where A/P is going to be processed. The "Offset Company" is the company to transfer money FROM. In the above example, money will transfer from Company 02 into the current company, which is 01. Next, enter the G/L account number to transfer the money TO, in the current company. It can be the bank account you will pay the invoice from or it can be a different account from which you will manually transfer the money into the bank account. If you are using different companies you can use Recurring Journal Entries if you wish. Next, enter the G/L account number to transfer the money FROM, which will be in the Offset company. It can be the actual bank account or a different G/L account. If it is a different account, you will want to create manual transactions in both the bank account and the transfer account. If you are using different companies you can use Recurring Journal Entries if you wish. When you get to the "OK?" prompt, type Y and press Enter. That is all you need to do to set up the transfer accounts. The images below show what happens when you create and pay an A/P invoice. The A/P invoice above is in Company 01. Note that in the "Invoice distribution", 200.00 was entered for Company 01 and 300.00 was entered for Company 02. Both are going to the expense account for advertising. As you create the invoice you will designate the G/L expense, liability, or other account, and the amount of money to each account, in each company. Now you are ready to pay the invoice. Below is the GL batch showing the invoice and payment. The A/P credit of $500.00 into Company 01 for the invoice entry and a debit of $500 in Company 01 for the payment of the invoice. The debit to expense of $200 into Company 01 and $300 into Company 02. The credit of $500 to the Company 01 bank account when the check was paid. "INTER-COMPANY TRANSFERS" shows the amount debited in Company 01 and credit in Company 02. Remember, the funds were transferred From 02 and TO Company 01 in our example. 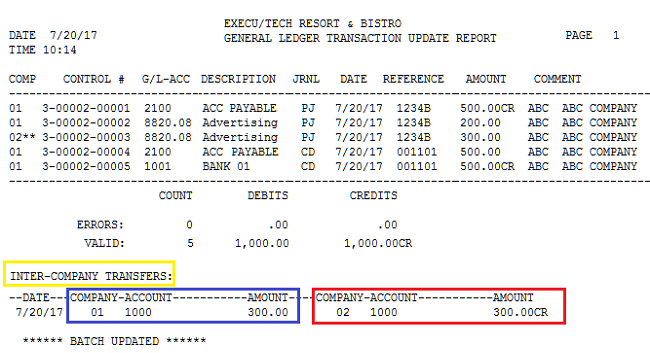 Here is the General Ledger detail of both companies for all G/L accounts related to this transaction. Note that I can now manually transfer the funds from GL Account 1000 into GL Account 1001 if that is what I wish to do. Alternatively, if you set the inter-company transfer account to the actual bank account you do not need to do this step. Helpful Hint: To make sure you have set this up correctly, you might set up a dummy A/P vendor account, create an A/P invoice, pay the invoice, then update the batch. Print the GL detail from both companies to see where everything ended up. Click HERE to see the previous Back Office manual.